Analysis Google and Tri Alpha Energy, a Californian energy company, say they have come up with an algorithm that appears to help scientists generate hotter plasma more efficiently for nuclear fusion experiments. Keyword: experiments. Billions of dollars have been poured into achieving clean, carbon-free energy harnessed from smashing atoms together. Yet progress has been slow. It’s tricky, as well as massively expensive, to sustain a hot plasma environment necessary for fusion reactions. Enter the Optometrist Algorithm. This code is designed to produce this vital plasma more efficiently. The amount of energy required to fire up and operate today's fusion systems would vastly outweigh whatever useful energy you can get out of them. The algorithm attempts to help boffins close that gap and thus steer the technology toward being an economically viable electrical power source – a replacement for coal, gas and nuclear fission, in other words. First, a stream of hot plasma made of ions and electrons is injected into Tri Alpha Energy's 20-metre (65-foot)-long chamber dubbed the C-2U machine. This stream is controlled by a magnetic field. Executing fusion experiments is rather fiddly – there are thousands of parameters to adjust, like voltages or setting the strength of the magnetic fields in different regions. So, next, the Optometrist Algorithm presents human operators with various choices to help them fine-tune the parameters for optimum performance, just like opticians offer different types and configuration of lenses to help figure out the prescription for someone’s glasses. The plasma and hydrogen atoms screaming through the C-2U were spun in a magnetic field for ten milliseconds using parameters suggested by the algorithm. These experiments were repeated every eight minutes. The results, published in Scientific Reports on Tuesday, show that the custom software helped reduce the energy loss rate by a factor of two, while increasing the temperature of the plasma. 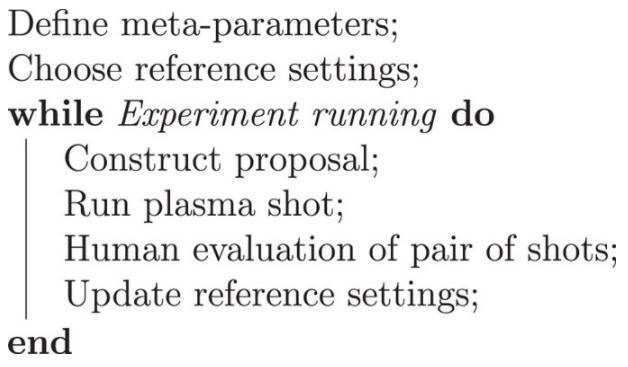 Sadly, the paper doesn't go into technical detail on the tuning program other than to offer a handful of formulas and the following generic pseudocode. Pseudocode of how the Optometrist Algorithm works ... It requires a human operators to chooses the best configuration of the different parameters as a reference setting Image credit: Baltz et al. Perhaps it's nothing more than that. “Just like getting an eyeglass prescription, the algorithm presents the expert human with machine settings and the associated outcomes," he explained. "They can just use their judgement on what is interesting, and what is unhealthy for the machine. These could be ‘That initial collision looked really strong!’ or ‘The edge biasing is actually working well now!’ or ‘Wow, that was awesome, but the electrode current was way too high, let’s not do that again!’ The key improvement we provided was a technique to search the high-dimensional space of machine parameters efficiently." Since the tests in September 2015, Tri Alpha Energy has replaced its C-2U machine with an upgraded plasma generator called Norman, named after the company’s late cofounder Norman Rostoker. Norman is gearing up for its testing phase. The Optometrist Algorithm may help engineers running experiments on that equipment find the optimum conditions for plasma generation. Tri Alpha Energy hopes to perfect this stage before fusing hydrogen and boron atoms together to crank out helium and energy. It's that output energy that would be used to boil water to create steam and drive turbines and generators to make electricity in the usual way. It’s all an ongoing effort between Google and the energy corp to make fusion power work efficiently. Right now, it's still very much experimental. PS: Relevant XKCD is relevant.